The midline in front of the neck has a prominence of the thyroid cartilage termed the laryngeal prominence, or the so-called "Adam's apple." Between the Adam’s apple and the chin, the hyoid bone can be felt; below the thyroid cartilage, a further ring that can be felt in the midline is the cricoid cartilage. Between the cricoid cartilage and the suprasternal notch, the trachea and isthmus of the thyroid gland can be felt. The cervical spine is made of 7 cervical vertebrae deemed C1 to C7. The cervical portion of the spine has a gentle forward curve called the cervical lordosis. Certain cervical vertebrae have atypical features and differ from the general form of a typical vertebra. The main arteries in the neck are the common carotids, and the main veins of the neck that return the blood from the head and face are the external and internal jugular veins. The anterior cervical triangle is bounded by the midline anteriorly, mandible superiorly, and sternocleidomastoid muscle inferolaterally. This triangle is subdivided into 4 smaller triangles by the 2 bellies of the digastric muscle superiorly and the superior belly of the omohyoid muscle inferiorly. The submandibular triangle is bounded by the mandible and 2 bellies of the digastric muscle. It contains the submandibular salivary gland, hypoglossal nerve, mylohyoid muscle, and facial artery. The carotid triangle is bounded by the sternocleidomastoid muscle, posterior belly of the digastric muscle, and superior belly of the omohyoid muscle. It contains the carotid arteries and branches, internal jugular vein, and vagus nerve. The muscular or omotracheal triangle is bounded by the midline, hyoid bone, superior belly of the omohyoid muscle, and sternocleidomastoid muscle. It includes the infrahyoid musculature and thyroid glands with the parathyroid glands. The submental triangle is located beneath the chin, bounded by the mandible, hyoid, and anterior belly of the digastric muscle. The posterior cervical triangle is bounded by the clavicle inferiorly, sternocleidomastoid muscle anterosuperiorly, and trapezius muscle posteriorly. The inferior belly of the omohyoid divides this triangle into an upper occipital triangle and a lower subclavian triangle. The occipital triangle is bounded anteriorly by the sternocleidomastoid muscle, posteriorly by the trapezius, and inferiorly by the omohyoid muscle. The contents include the accessory nerve, supraclavicular nerves, and upper brachial plexus. The subclavian triangle is smaller than the occipital triangle and is bounded superiorly by the inferior belly of the omohyoid muscle, inferiorly by the clavicle, and anteriorly by the sternocleidomastoid muscle. The contents include the supraclavicular nerves, subclavian vessels, brachial plexus, suprascapular vessels, transverse cervical vessels, external jugular vein, and nerve to the subclavius muscle. The cervical spine is made of 7 cervical vertebrae deemed C1 to C7. The cervical portion of the spine has a gentle forward curve called the cervical lordosis. Certain cervical vertebrae have atypical features and differ from the general form of a typical vertebra. C1 is also called the atlas because it bears the head, "the globe." It has 2 concave superior facets that articulate with the occipital condyles of the skull. This important articulation provides 50% of the flexion and extension of the neck. C1 has no vertebral body and no spinous process. C2, otherwise called the axis, has a conelike projection from the vertebral body that articulates within the atlas. This atlantoaxial articulation is responsible for 50% of the rotation in the neck. The C2 to C7 vertebrae have foramina in each of the transverse processes and bifid spinous processes except for C7, which has a nonbifid and a prominent posterior spinous process that can be felt distinctly at the base of the neck. The vertebral artery travels in the foramina of the transverse processes. The spinal cord travels in the spinal canal about 17 mm in diameter formed by the vertebral arches behind the body. 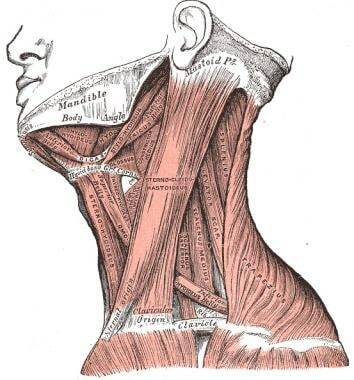 The muscles of the neck can be grouped according to their location. Those immediately in front and behind the spine are the prevertebral, postvertebral, and lateral vertebral muscles and on the side the neck are the lateral cervical muscles. In addition, a unique superficial muscle, the platysma, exists. The platysma muscles are paired broad muscles located on either side of the neck. The platysma arises from a subcutaneous layer and fascia covering the pectoralis major and deltoid at the level of the first or second rib and is inserted into the lower border of the mandible, the risorius, and the platysma of the opposite side. It is supplied by the cervical branch of the facial nerve. The platysma depresses the lower lip and forms ridges in the skin of the neck and upper chest when the jaws are "clenched" denoting stress or anger. It also serves to draw down the lower lip and angle of the mouth in the expression of melancholy. The sternocleidomastoid is the prominent muscle on the side of the neck. It arises from the sternum and clavicle by 2 heads. The medial or sternal head arises from the upper part of the anterior surface of the manubrium sterni and is directed upward, lateralward, and backward. The lateral or clavicular head, which is flatter, arises from the superior border and anterior surface of the medial third of the clavicle; it is directed almost vertically upward. The 2 heads are separated from each other at their origins by a triangular interval, but they gradually blend, below the middle of the neck, into a thick, rounded muscle. It is inserted by a strong tendon into the lateral surface of the mastoid process, from its apex to its superior border, and by a thin aponeurosis into the lateral half of the superior nuchal line of the occipital bone. It is supplied by the accessory nerve and branches from the anterior rami of the second and third cervical nerves. When only one side of the muscle acts, it draws the head toward the shoulder of the same side and rotates the head toward the opposite side. Acting together from their sternoclavicular attachments, the muscles flex the cervical part of the vertebral column. If the head is fixed, the 2 muscles assist in elevating the thorax in forced inspiration. The trapezius arises from the spinous processes of the cervical and thoracic vertebrae and inserts on the spine of the scapula and acromion; it is innervated by the spinal accessory nerve and branches from the third and fourth cervical roots. Its upper fibers shrug the shoulder and aid in suspension of the shoulder girdle (see the image below). Muscles in the front of the neck are the suprahyoid and infrahyoid muscles and the anterior vertebral muscles (see the images below). The suprahyoid muscles are the digastrics, stylohyoid, mylohyoid, and geniohyoid. The infrahyoid muscles are the sternohyoid, sternothyroid, thyrohyoid, and omohyoid. Muscles in the front of the neck. The suprahyoid muscles perform 2 very important actions. During the act of swallowing they raise the hyoid bone and, with it, the base of the tongue; when the hyoid bone is fixed by its depressors, they depress the mandible. During the initial phase of swallowing, when the food is shifted from the mouth into the pharynx, the hyoid bone and with it the tongue are carried upward and forward by the anterior bellies of the digastrics, the mylohyoids, and geniohyoids. In the next phase, when the food passes through the pharynx, the direct elevation of the hyoid bone takes place by the combined action of all the muscles; after the food has passed, the hyoid bone is carried upward and backward by the posterior bellies of the digastrics and the stylohyoids, which assist in preventing the return of the food into the mouth. The digastric muscle consists of 2 fleshy bellies united by an intermediate tendon. It lies below the body of the mandible and extends, in a curved form, from the mastoid process to the symphysis menti. The posterior belly, longer than the anterior, arises from the mastoid notch of the temporal bone and passes downward and forward. The anterior belly arises from the inner side of the lower border of the mandible, close to the symphysis, and passes downward and backward. The 2 bellies end in an intermediate tendon that perforates the stylohyoideus muscle and is held in connection with the side of the body and the greater cornu of the hyoid bone by a fibrous loop. 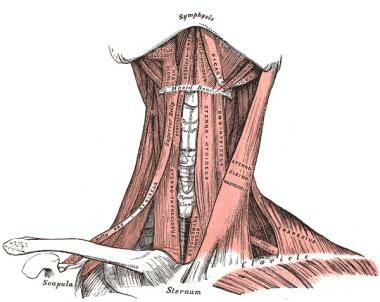 The stylohyoid muscle is a slender muscle lying in front of and above the posterior belly of the digastric muscle. It arises from the back and lateral surface of the styloid process, near the base; passing downward and forward, it is inserted into the body of the hyoid bone at its junction with the greater horn and just above the omohyoid. It is perforated, near its insertion, by the tendon of the digastric muscle. The mylohyoid muscle is flat and triangular and is situated above the anterior belly of the digastric, and it forms, with its fellow of the opposite side, a muscular floor for the oral cavity. It arises from the whole length of the mylohyoid line of the mandible, extending from the symphysis in front to the last molar tooth behind. The posterior fibers pass medialward and slightly downward to be inserted into the body of the hyoid bone. The middle and anterior fibers are inserted into a median fibrous raphe extending from the symphysis menti to the hyoid bone, where they join at an angle with the fibers of the opposite muscle. This median raphe is sometimes wanting; the fibers of the 2 muscles are then continuous. The geniohyoid muscle is a narrow muscle, situated above the medial border of the mylohyoideus. It arises from the inferior mental spine on the back of the symphysis menti and runs backward and slightly downward to be inserted into the anterior surface of the body of the hyoid bone; it lies in contact with its fellow of the opposite side. The mylohyoid branch of the inferior alveolar nerve supplies the mylohyoid and anterior belly of the digastric muscle. The facial nerve supplies the stylohyoid and posterior belly of the digastric. C1 fibers that travel with the hypoglossal nerve supply the geniohyoid muscle. The sternohyoid muscle is a thin, narrow muscle, which arises from the posterior surface of the medial end of the clavicle, posterior sternoclavicular ligament, and upper and posterior part of the manubrium sterni. Passing upward and medialward, it is inserted, by short, tendinous fibers, into the lower border of the body of the hyoid bone. The infrahyoid muscles are supplied by branches from the first 3 cervical nerves via the ansa cervicalis. These muscles depress the larynx and hyoid bone, after they have been drawn up with the pharynx in the act of deglutition. The omohyoids not only depress the hyoid bone but also carry it backward and to one or the other side. The sternothyroid muscle is shorter, wider, and deeper than the sternohyoid. It arises from the posterior surface of the manubrium sterni, below the fibers of the sternohyoid, and from the edge of the cartilage of the first rib. It is inserted into the oblique line on the lamina of the thyroid cartilage. The thyrohyoid muscle is a small, quadrilateral muscle that arises from the oblique line on the lamina of the thyroid cartilage and is inserted into the lower border of the greater horn of the hyoid bone. The omohyoid muscle consists of 2 fleshy bellies united by a central tendon. It arises from the upper border of the scapula. From this origin, the inferior belly forms a flat, narrow fasciculus, which inclines forward and slightly upward across the lower part of the neck, being bound down to the clavicle by a fibrous expansion; it then passes behind the sternocleidomastoid, becomes tendinous, and changes its direction, forming an obtuse angle. The omohyoid muscle ends in the superior belly, which passes almost vertically upward, close to the lateral border of the sternohyoideus, to be inserted into the lower border of the body of the hyoid bone, lateral to the insertion of the sternohyoid. The central tendon of this muscle varies a great deal in length and form, and it is held in position by a process of the deep cervical fascia, which sheaths it, and extends downward to be attached to the clavicle and first rib; it is by this means that the angular form of the muscle is maintained. The anterior vertebral muscles are the longus colli, longus capitis, rectus capitis anterior, and rectus capitis lateralis. The longus colli muscle is situated on the anterior surface of the vertebral column, between the atlas and the third thoracic vertebra. It is broad in the middle, narrow and pointed at either end, and consists of 3 portions: superior oblique, an inferior oblique, and a vertical. The superior oblique portion arises from the anterior tubercles of the transverse processes of the third, fourth, and fifth cervical vertebrae and, ascending obliquely with a medial inclination, is inserted by a narrow tendon into the tubercle on the anterior arch of the atlas. The inferior oblique portion, the smallest part of the muscle, arises from the front of the bodies of the first 2 or 3 thoracic vertebrae and, ascending obliquely in a lateral direction, is inserted into the anterior tubercles of the transverse processes of the fifth and sixth cervical vertebrae The vertical portion arises , below, from the front of the bodies of the upper 3 thoracic and lower 3 cervical vertebrae and is inserted into the front of the bodies of the second, third, and fourth cervical vertebrae. The longus capitis is broad and thick above, narrow below, and arises by 4 tendinous slips, from the anterior tubercles of the transverse processes of the third, fourth, fifth, and sixth cervical vertebrae, and ascends, converging toward its fellow of the opposite side, to be inserted into the inferior surface of the basilar part of the occipital bone. The rectus capitis anterior is a short, flat muscle, situated immediately behind the upper part of the longus capitis. It arises from the anterior surface of the lateral mass of the atlas and from the root of its transverse process, and passing obliquely upward and medialward, it is inserted into the inferior surface of the basilar part of the occipital bone immediately in front of the foramen magnum. The rectus capitis lateralis is a short, flat muscle, which arises from the upper surface of the transverse process of the atlas and is inserted into the undersurface of the jugular process of the occipital bone. The rectus capitis anterior and the rectus capitis lateralis are supplied from the loop between the first and second cervical nerves; the longus capitis, by branches from the first, second, and third cervical; the longus colli, by branches from the second to the seventh cervical nerves. The longus capitis and rectus capitis anterior are the direct antagonists of the muscles at the back of the neck, serving to restore the head to its natural position after it has been drawn backward. These muscles also flex the head, and from their obliquity, rotate it, so as to turn the face to one or the other side. The rectus lateralis, acting on one side, bends the head laterally. The longus colli flexes and slightly rotates the cervical portion of the vertebral column. The lateral vertebral muscles are the scalenus anterior, scalenus medius, and scalenus posterior. Scalenus anterior lies at the side of the neck, behind the sternocleidomastoid. It arises from the anterior tubercles of the transverse processes of the third, fourth, fifth, and sixth cervical vertebrae, and descending, almost vertically, is inserted by a narrow, flat tendon into the scalene tubercle on the inner border of the first rib and into the ridge on the upper surface of the rib in front of the subclavian groove. Scalenus medius the largest and longest of the three scaleni, arises from the posterior tubercles of the transverse processes of the lower 6 cervical vertebrae, and descending along the side of the vertebral column, is inserted by a broad attachment into the upper surface of the first rib, between the tubercle and the subclavian groove. Scalenus posterior, the smallest and most deeply seated of the 3 scaleni, arises, by 2 or 3 separate tendons, from the posterior tubercles of the transverse processes of the lower 2 or 3 cervical vertebrae and is inserted by a thin tendon into the outer surface of the second rib, behind the attachment of the serratus anterior. It is occasionally blended with the scalenus medius. The scaleni are supplied by branches from the second to the seventh cervical nerves. When the scaleni act from above, they elevate the first and second ribs, and are, therefore, inspiratory muscles. Acting from below, they bend the vertebral column to one or other side; if the muscles of both sides act, the vertebral column is slightly flexed. The suboccipital group comprises the rectus capitis posterior major, rectus capitis posterior minor, obliquus capitis inferior, and obliquus capitis superior. Rectus capitis posterior major (rectus capitis posticus major) arises by a pointed tendon from the spinous process of the axis, and, becoming broader as it ascends, is inserted into the lateral part of the inferior nuchal line of the occipital bone and the surface of the bone immediately below the line. As the muscles of the 2 sides pass upward and lateralward, they leave between them a triangular space, in which the recti capitis posteriores minores are seen. Rectus capitis posterior minor (rectus capitis posticus minor) arises by a narrow pointed tendon from the tubercle on the posterior arch of the atlas, and, widening as it ascends, is inserted into the medial part of the inferior nuchal line of the occipital bone and the surface between it and the foramen magnum. Obliquus capitis inferior (obliquus inferior), the larger of the 2 oblique muscles, arises from the apex of the spinous process of the axis and passes lateralward and slightly upward to be inserted into the lower and back part of the transverse process of the atlas. Obliquus capitis superior (obliquus superior), narrow below, wide and expanded above, arises by tendinous fibers from the upper surface of the transverse process of the atlas, joining with the insertion of the preceding. It passes upward and medialward and is inserted into the occipital bone, between the superior and inferior nuchal lines, lateral to the semispinalis capitis. The deep muscles of the back and the suboccipital muscles are supplied by the posterior primary rami of the spinal nerves. The 2 recti draw the head backward. The rectus capitis posterior major, owing to its obliquity, rotates the skull, with the atlas, around the odontoid process, turning the face to the same side. The obliquus capitis superior draws the head backward and to its own side. The obliquus inferior rotates the atlas, and with it the skull, around the odontoid process, turning the face to the same side. Between the obliqui and the rectus capitis posterior major is the suboccipital triangle. It is bounded, above and medially, by the rectus capitis posterior major; above and laterally by the obliquus capitis superior; and below and laterally by the obliquus capitis inferior. It is covered by a layer of dense fibro-fatty tissue, situated beneath the semispinalis capitis. The floor is formed by the posterior atlanto-occipital membrane and the posterior arch of the atlas. The vertebral artery and the first cervical or suboccipital nerve are in the groove on the upper surface of the posterior arch of the atlas. 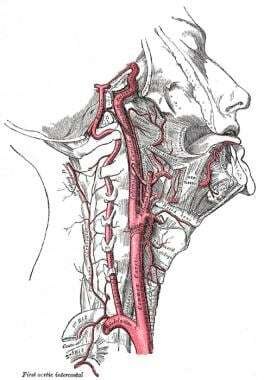 The main arteries in the neck are the common carotids arising differently, one on each side (see the images below). On the right, the common carotid arises at the bifurcation of the brachiocephalic trunk behind the sternoclavicular joint; on the left, it arises from the highest point on arch of the aorta in the chest. Dissection of the side of the neck showing the major arteries. The common carotid arteries ascend in the neck and divide at the level of upper border of the thyroid cartilage into 2 branches, the external and internal carotid arteries. The external carotid artery supplies the exterior of the head; the face and the neck and the internal carotid artery supplies the cranial and intraorbital contents. The common carotid arteries lie on either side of the trachea. The common carotid artery, the internal jugular vein, and the vagus nerve are enclosed in a fibrous sheath called the carotid sheath, which is part of the deep cervical fascia. Within this sheath, the vein lies lateral to the artery and nerve between and behind the vessels. Descending in front of its sheath is the superior root of the ansa cervicalis, which accompanies the hypoglossal nerve below the skull to the level of the greater horn of the hyoid bone. In the lower part of the neck, the common carotid artery is covered by the sternocleidomastoid muscle. 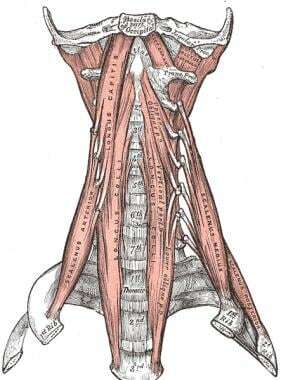 As it ascends, only the medial border of this muscle covers it. It is crossed by the thyroid vessels at the level of the thyroid gland. Behind and medial to the carotid artery lie the sympathetic trunk, the longus colli and longus capitis, and, directly posteriorly, the transverse processes of the cervical vertebrae, successively. Medial to the artery are the esophagus, the trachea, and the thyroid gland. The recurrent laryngeal nerve is interposed higher up between the trachea and esophagus. Lateral to the artery lies the internal jugular vein. Within the angle of bifurcation of the common carotid artery is a reddish-brown oval body, known as the carotid body. 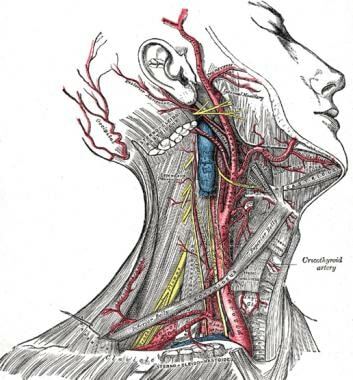 The external carotid artery begins at the level of the upper border of the thyroid cartilage, and taking a slightly curved course, it passes upward and forward and then inclines backward to the space behind the neck of the mandible, where it divides into the superficial temporal and maxillary arteries. It rapidly diminishes in size in its course up the neck, owing to the number and large size of the branches given off from it — namely, the superior thyroid, lingual, facial, occipital, posterior auricular, ascending pharyngeal, superficial temporal, and maxillary. The internal carotid artery begins at the bifurcation of the common carotid, at the level of the upper border of the thyroid cartilage, and runs upward, in front of the transverse processes of the upper 3 cervical vertebrae, to the carotid canal in the petrous portion of the temporal bone. It lies behind the sternocleidomastoid and lateral to the external carotid. It passes below the parotid gland and is crossed by the hypoglossal nerve, the digastrics and stylohyoid muscles, and the occipital and posterior auricular arteries. Behind the artery lies the longus capitis, the superior cervical ganglion of the sympathetic trunk, and the superior laryngeal nerve; lateral to it lie the internal jugular vein and vagus nerve. Medial to it lie the pharynx, superior laryngeal nerve, and ascending pharyngeal artery. At the base of the skull, the glossopharyngeal, vagus, accessory, and hypoglossal nerves lie between the artery and the internal jugular vein. The cervical portion of the internal carotid gives off no branches. The main veins of the neck that return the blood from the head and face are the external and internal jugular veins. The external jugular vein receives blood from the exterior of the cranium and the deep parts of the face and is formed by the posterior division of the retromandibular vein joining with the posterior auricular vein. It begins in the substance of the parotid gland, on a level with the angle of the mandible, and runs down in the neck, in the direction of a line drawn from the angle of the mandible to the middle of the clavicle at the posterior border of the sternocleidomastoid muscle. It is separated from the sternocleidomastoid by the superficial layer or investing layer of the deep cervical fascia and is covered by the platysma, the superficial fascia, and the integument. This vein receives the occipital occasionally, the posterior external jugular, and, near its termination, the transverse cervical, suprascapular, and anterior jugular veins; in the substance of the parotid, a large branch of communication from the internal jugular may join it. The internal jugular vein collects the blood from the brain, from the superficial parts of the face, and from the neck. It is directly continuous with the sigmoid sinus and begins in the posterior compartment of the jugular foramen, at the base of the skull. It runs down the side of the neck in a vertical direction, lying at first lateral to the internal carotid artery and then lateral to the common carotid; at the root of the neck, it unites with the subclavian vein to form the brachiocephalic vein. Behind it lies the internal carotid artery, and the vagus descends between and behind the vein and the artery in the same sheath; the accessory runs obliquely backward, superficial or deep to the vein. This vein receives in its course the inferior petrosal sinus; the common facial, lingual, pharyngeal, superior, and middle thyroid veins; and sometimes the occipital. The thoracic duct on the left side and the right lymphatic duct on the right side open into the angle of union of the internal jugular and subclavian veins. Gray H. Anatomy of the Human Body. Philadelphia: Lea & Febiger, 1918; 2000. [Full Text]. The author wishes to acknowledge Ms. Suzanne Simpson for her literary edits.